Performers include: Jean Vander Pyl, Alan Reed, Mel Blanc, Bea Benaderet, John Stephenson, Hal Smith, and Doug Young. 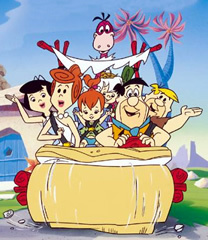 The Flintstones are a typical suburban family that just happens to live in the stone-age. Patriarch Fred (Alan Reed) works hard at the local rock quarry for his grumpy boss Mister Slate (John Stephenson). At quitting time, he races home for a brontosaurus burger dinner and to see his wife Wilma (Jean Vander Pyl), baby daughter Pebbles (Jean Vander Pyl), and exuberant pet dinosaur Dino (Mel Blanc). The family’s best friends are their next-door neighbors the Rubbles; Barney (Mel Blanc), wife Betty (Bea Benaderet, later Gerry Johnson), and their super-strong adopted son, Bamm-Bamm (Don Messick). Much of the series’ humor arises from Fred and Barney’s attempts go to lodge meetings or go bowling when they should be doing chores at home.